Tournament | Midwest Taekwondo | For Sport. For Health. For Life. 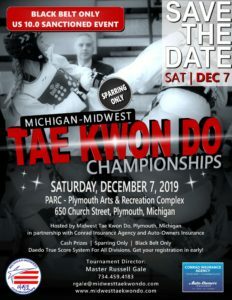 We are pleased to invite you to the 13th Annual Michigan-Midwest Tae Kwon Do Championships, which will be held on Saturday, December 7, 2019. This year we are hosting an all new event!! Our 2019 tournament will be a BLACK BELT ONLY, U.S. 10.0 SANCTIONED EVENT and will take place at a NEW VENUE, the historic PARC – Plymouth Arts & Recreation Complex located in the heart of downtown Plymouth, Michigan! We look forward to seeing you this December and will post more details as we approach this event. MANY THANKS TO OUR SPONSORS! WE APPRECIATE YOUR SUPPORT!